When it's half-time during the televised NBA playoff game today between the Washington Bullets and the Atlanta Hawks part of the entertainment will be furnished by the dance group trained and choreographed by a former local woman. 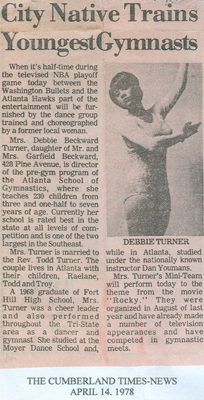 Mrs. Debbie Beckward Turner, daughter of Mr. and Mrs. Garfield Beckward, 428 Pine Avenue, is director of the pre-gym program of the Atlanta School of Gymnastics, where she teaches 230 children from three and one-half to seven years of age. Currently her school is rated best in the state at all levels of competition and is one of the two largest in the Southeast. Mrs. Turner is married to the Rev. Todd Turner. The couple lives in Atlanta with their children, Raelane, Todd and Troy. A 1968 graduate of Fort Hill High School, Mrs. Turner was a cheer leader and also performed throughout the Tri-State area as a dancer arid gymnast. She studied at the Moyer Dance School and, while in Atlanta, studied under the nationally known instructor Dan Youmans. Mrs. Turner's Mini-Team will perform today to the theme from the movie "Rocky." They were organized in August of last year and have already made a number of television appearances and have competed in gymnastic meets.